Studies have shown how heavy metals, particularly mercury, together with bacterial toxins, damage nerve tissue. In combination with the bacterial toxins, the now organic mercury becomes more liposoluble and therefore reaches the nerve tissue more quickly. Intact tubulin is the prerequisite for neuronal transport and supplying the axons. Beta tubulin is rich in sulfhydryl groups that quickly form a stable bond with heavy metals. The landing place for the necessary GuanosinTriPhosphat (GTP) is thus taken. The polymerisation of tubulin to form microtubules and thus supply and regeneration of the axon does not take place. In addition, bacterial toxins inhibit creatinekinase and consequently also the conversion of GDP into GTP. Normal alpha (red) and beta (white) tubulin (microtubules) surrounds neurofibrils. One of the roles of the microtubules is to supply the long axon with nutrients. Mercury occupies the GTP landing places on the beta subunits of the tubulin. 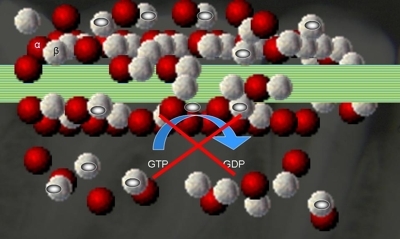 Without the energy supply through the conversion of GTP to GDP, the tubulin dissolves and the nerves are destroyed. The neurofibrils lie waste, curl up in balls and present a similar microscopic picture to that of Alzheimer’s.